Purchase this high quality art print produced on 11x17 inch (28x43 cm) 100% acid free heavy duty premium paper. When matted and framed it makes a beautiful addition to your décor. Be sure to check walking tours of this historic and beautiful district. You can easily spend an entire day in Little Italy, the art district, shops, coffee houses, or NYU so be prepared to have fun. The day I visited was sunny and warm so I had lunch outside in Little Italy, a recommended experience. Then I walked for hours soaking in charm and loved every minute. To check out more of Doug's and see more for the online art gallery click here for the web gallery of art . 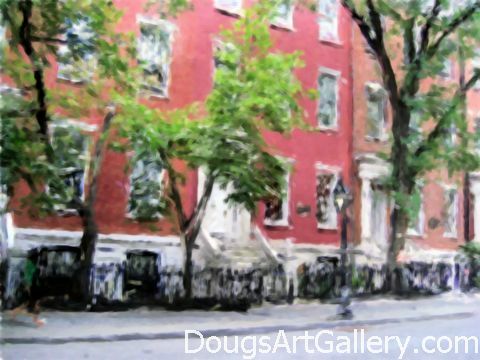 Click here to leave Greenwich Village New York for more links to artists and their online art galleries, art prints and art posters. Browse the links found at the bottom of Home Page.